It's a nice way to dress up your hotdog sandwiches for the little kids. Probably a take on the burger and fries combo that many burger joints have been promoting for some time, this one can be a classic afternoon snack. It's filling, tasty, and cheesy, not to mention pretty enough to catch the attention of everyone, even those who are just kids at heart. Be a kitchen star to your kids! 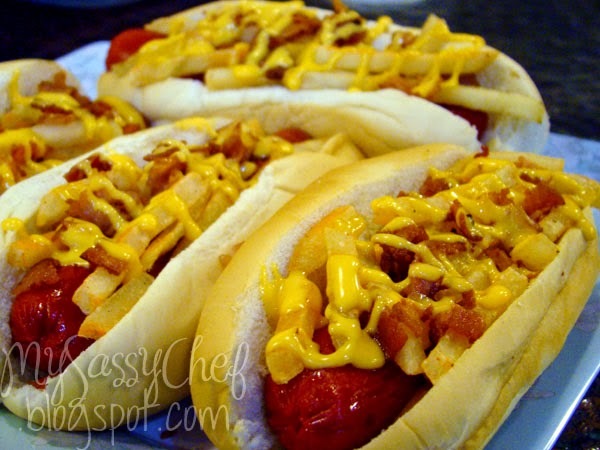 Make this cheesy hotdog sandwich topped with crisp fries and sweet bacon bits for them anytime of the day. Featured previously on SM Master Chef's Cooking Marathon, I decided to give each recipe another chance at the limelight. Deep fry french fries until crisp. Drain on paper towels. Pan fry hotdogs until cooked through. Toss fries with cheese powder until well coated then top over sandwich. Sprinkle chopped bacon over fries. Drizzle with desired amount of cheese spread. A trip to the grocery store or supermarket, consumers are faced with a lot of brand options to choose from when buying produce. While most go for the fresh, unprocessed meat products, many still prefer processed foods to save time on preparation and to save themselves from the stress of deciding what to serve for the day. They say that processed meats lack the quality and taste of homemade meals, but Frabelle Corporation begs to differ. The company, who chose Senator Chiz Escudero for his credibility and reach, has boomed in profits and sales since its first launch in the market last year. Going by the motto, "Sadyang Pinasarap", the company promises that their products are not produced for profit by cutting back on quality as most processed foods have been given that impression. It instead adheres with old world culinary disciplines, such as naturally smoking meat and blow-torching sugar, combined with state of the art equipment to make their products stand out amidst the multitude of similar products already established in the market. Frabelle Foods meat products not only have the taste of well-prepared foods that your family will surely love, they have affordable prices and consumers gets more than their money's worth. Some of you may remember the TV commercial featuring the senator, with his line, "Iba ang pinasarap ng pinag-ukulan ng panahon, iba ang preparasyon, mataas ang quality, sadyang pinasarap." With the National Meat Inspection Service granting the company an AAA certification, we can all be assured that Frabelle Foods will definitely hold on to their promise. Some of the company's featured products are Yummy! Hotdogs and Cheesedogs, Pork Ham Tocino, Honey Ham, Hickory Smoked Bacon, Longganisa Hamonado, Pear Shaped Ham, and Honey Glazed Ham. Here's a quick preview of one of their products that is always welcome in our home, anytime of the day. I also have a review about Frabelle Food's longganisa, tocino, and other products. Frabelle Foods Longganiza Hamonado is made from combination of ground pork and beef blended with the right spices and ingredients which give its sweet, spicy and garlicky taste. The meat blend is reduced to a homogeneous mass called emulsion, stuffed into collagen casings, and then cooked to the required internal temperature. The finished product has a distinct brown skin color. It is firm and the cooked product has a predominant meaty taste of sausage. It is smoked with 100% natural imported wood chips that give the sausage their natural smoky aroma and flavor. If you want to have a fun and tasty, no-fuss breakfast, then this western style fried rice perfect for cowboys and cowgirls is definitely worth a try. 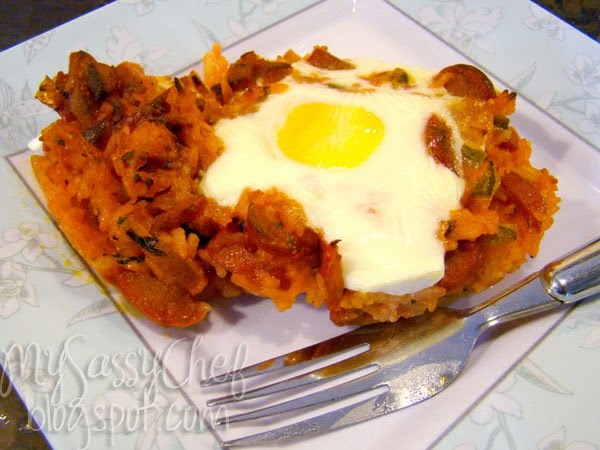 The Star Ranchero Rice is a one-pot dish that's perfect for breakfast. It's reminiscent of Mexican spices, Jamaican patties, burritos and the Wild West cartoons I loved watching as a kid. The dish has a little heat and a load of flavor that's not too strong for kids to handle. Featured previously on SM Master Chef's Cooking Marathon, I decided to give each recipe another chance at the limelight. Pour oil in a standard rice cooker, heat through and saute onions, bell pepper and tomatoes. Slightly cook. Add sliced hotdogs and stir for a minute. Add rice, cilantro, siling labuyo and beef broth. Mix well and cover until rice is cooked through. Transfer the rice mixture into an oven proof baking dish. 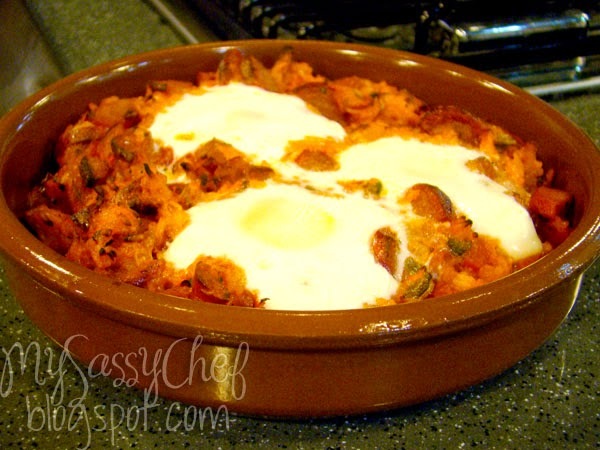 Crack eggs over the rice and broil in oven or turbo until eggs are cooked. There's nothing complicated about grilled cheese. In fact, I bet you know how to make this snack anyway. And since I pretty much want to laze around all day and watch TV, I'm cutting this post early and giving you the recipe for a spicy, juicy, and gooey grilled cheese sandwich, perfect for any time of the day. Simply brush each slice of bread with butter, top with lots of grated cheese. Add in tomatoes, and sprinkle with cayenne pepper, basil, or any herbs and spices of your choice.